KUALA LUMPUR: Malaysia’s economy expanded at 4.7% in the fourth quarter of 2018 (Q4 2018), which was above Bloomberg’s survey of a 4.5% growth, after the moderation in the two consecutive quarters. “On the supply side, services and manufacturing sectors remained the key drivers of growth,” she said during the briefing on the gross domestic product (GDP) data on Thursday. Nor Shamsiah said Malaysia’s macroeconomic fundamentals continue to remain strong despite domestic and external headwinds. 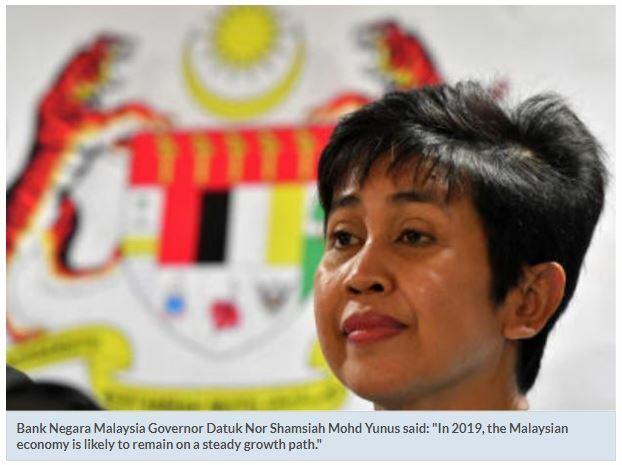 “In 2019, the Malaysian economy is likely to remain on a steady growth path, supported by resilience of private consumption and continuation of civil engineering projects apart from recovery from supply side shocks,” she said. In a separate statement, Chief Statistician Datuk Seri Dr. Mohd Uzir Mahidin said for 2018, the value of gross domestic product (GDP) recorded RM1.23 trillion at constant prices and RM1.43 trillion at current prices.Mohd Uzir said Malaysia’s current account surplus surged to RM10.8bil in the final quarter of 2018. The favourable performance was spurred by the larger surplus in goods account at RM33bil from RM26.6bil in Q3.